County Line Youth Soccer League is an independent non-profit organization, offering recreational and competitive soccer. Registration is open April 1st - June 1st for the 2019 season. CLYSL will not accept late registrations this year. Registrations postmarked after 6/1 will be put on a wait list. *There are no pets allowed at any County Line event. 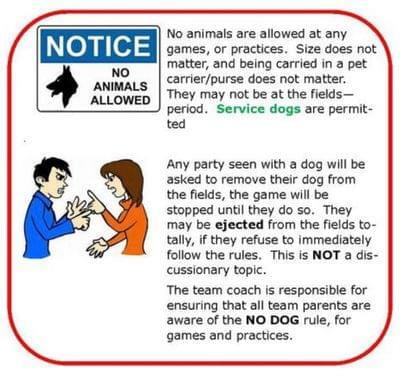 You will be asked to leave, and the game will not begin, unless it is a service animal. For the Class of 2019 County Line Youth Soccer will be awarding two scholarships. We will be selecting one boy and one girl who has played in the league during their Highschool years. Each scholarship will be in the amount of $1,000. Please email Stephanie Moe at [email protected] for full criteria. About the scholarship: In February 2018 Carole Myrick, longtime Registrar for County Line Youth Soccer League was diagnosed with stage 4 brain cancer. On November 4th 2018 Carole lost her battle with this horrible disease and was called home. County Line would not be what it is today without Carole’s hard work and dedication to the youth of the City of Galt. Keep an eye out at our registration events for CLYSL gear! Please note there are NO ANIMALS allowed at County Line events. What an inspirational new logo for our shirts and sweatshirts, that are available for purchase.